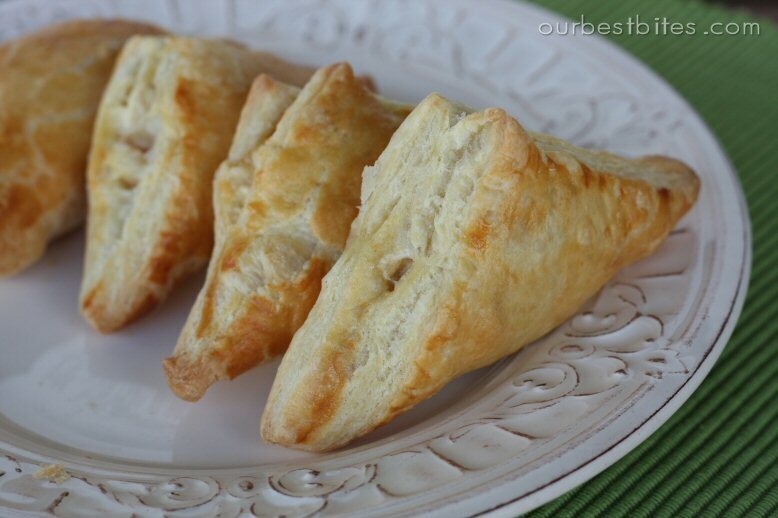 These little pastries are filled with a cheesy, savory filling. I’ll tell you right now- they’re addictive! They don’t require a lot of ingredients and you can eat them warm or at room temp, which is always a plus. These work just as great for an afternoon picnic as they do for a fancy appetizer at a party or wedding shower. Read on to see how we do it! If you’ve never used puff pastry before, it’s found in the freezer section of the grocery store. It’s usually near the desserts and frozen dough. Just follow the instructions on the package to defrost. While that’s happening, mix up your filling. I used Chive and Onion flavored cream cheese because all of the flavors are right in the little package! No need to add any spices, so it’s quick and easy. Roll out the pastry and then use a pizza cutter to slice into squares. Have a little bowl of water nearby and use a wet finger to moisten the edges. 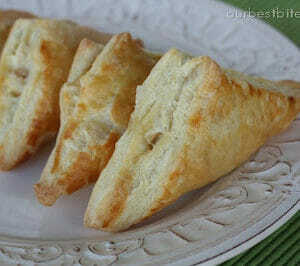 Fold the pastry over to make triangles. 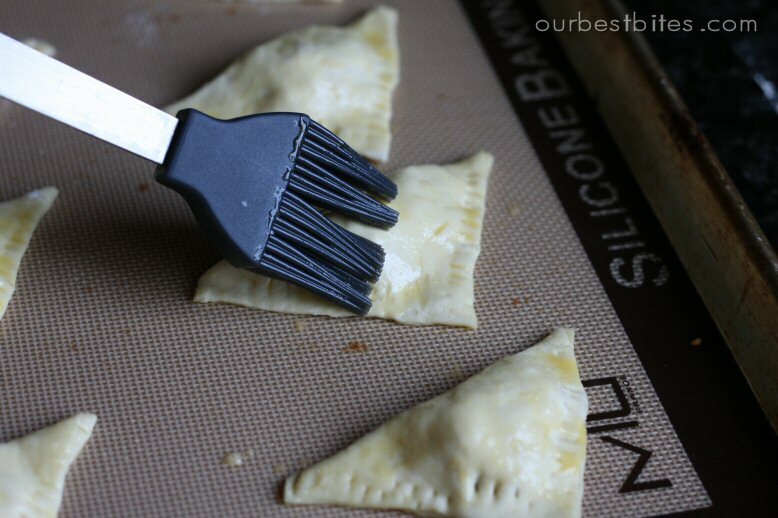 You can use a fork to crimp the edges, or it actually works just fine to seal them shut with your fingers. Give them a quick brush of egg wash and then pop them in the oven. While that pastry is puffing up to perfection, the insides are warming up and all of that cheese is melting. They’re amazing warm, but they actually taste great at room temperature as well. So they’d make a great little snack to make ahead and take on a picnic or to a party. And you could totally make them larger and pair them with a salad for a fun lunch. Warm cream cheese in the microwave for 20-30 seconds to soften. Place in a mixing bowl with mozzarella cheese, chicken, bacon, and sun-dried tomatoes. Stir to combine and set aside. Defrost puff pastry sheets according to package directions. Lightly dust a work surface with flour and roll one sheet at a time into a 12 x 12 inch square. Cut 4, 3 inch strips each direction to make 16 squares, 3 x 3″ each. Place about 2 teaspoons of cream cheese mixture onto each square. With your finger, brush a dab of water around the edges of each square and fold over diagonally to make a triangle. Press edges together and crimp with a fork to seal. After stuffing and folding each pastry, place on a baking sheet. Whisk egg and 1 tablespoon water together and brush over the top of each pastry. Bake in preheated oven for 12-15 minutes or until puffed and golden brown. Cool 10 minutes before serving. Can also be served at room temperature. Follow directions through egg wash. Place baking sheet in the freezer. When pastries are solid to the touch, transfer to an airtight container and store in the freezer. 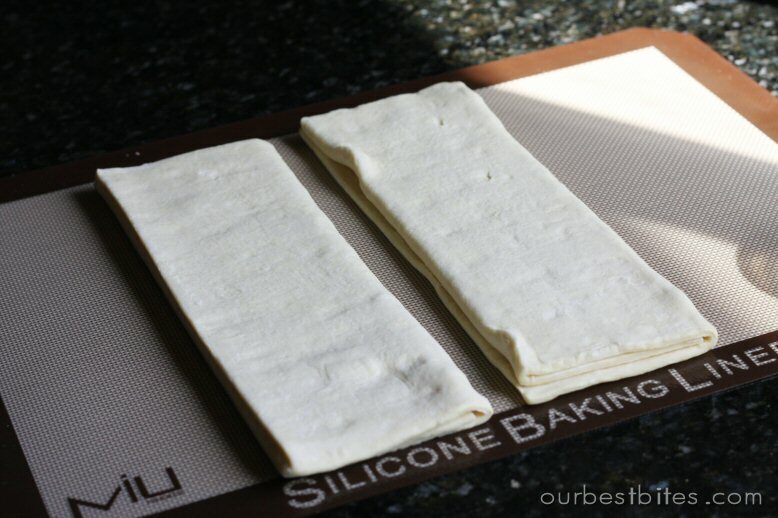 When ready to bake, place frozen pastries directly on a baking sheet in preheated 400 degree oven and bake for 15-20 minutes or until puffed and golden. I'm learning that you all love chicken and bacon together as much as I do! I'm loving the recipes using that combo! This one sounds great! yum! I love that you added sundried tomatoes! Yay! Another recipe that I can use in my son's lunches. Thank you! You are adorable! These look great, can't wait to try them! Yummy! 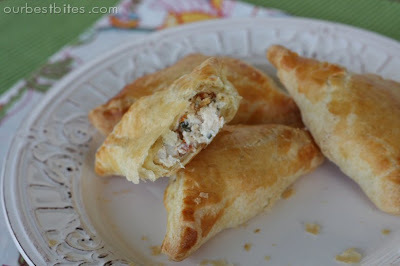 I love appetizer recipes and these look perfect…can't go wrong with cream cheese and bacon! Okay…the ingredients for these little bites are going on the grocery list right now! I'm a sucker for a chicken, cheese, and bacon combo so this recipe sounds delicious to me! Can't wait to try them. Thanks for all of your great ideas! Sara, you are so adorable! You look great in your video. The pastry pockets also look great- I'll have to put them on the menu this week! Any dish with the word "creamy" in it is tops in my book! Chicken and bacon, a perfect combo! I make these chicken salad sandwiches on crossaints…but, not your typical chicken salad. I do chicken, bacon (yum! ), ranch dressing and some other seasonings….I love it. I could eat 10 of them in one sitting. It doesn't help me at all that I'm also pregnant and endlessly hungry. My cheeks totally chub out too! Anyway, I've been meaning to post the recipe on my blog…I'll send it over when I put it up. Thanks for this! YUM! I"m sure my kids would love this for dinner! I make your teriyaki chicken kabobs a lot too! Loved the video! Great recipe. 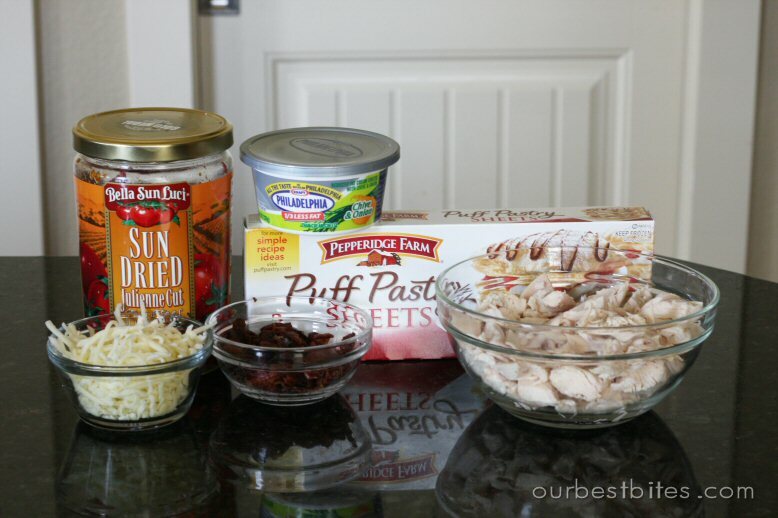 I would love to make this the next time I make puff pastry. YUM! Looks great Sara! Well done. Made these for dinner last night and my 3 year old ate six of them – So they are kid tested and approved in my home. And my husband is still raving about them. :o) Thanks for a new family favorite! I just made them. Oh my yummy goodness….. I am bringing them to a brunch today. Your going to be the hit of the party!!!! Thank you Sara!!! Good luck! You will do great! What a fabulous video!! The recipe looks good too! These sound very yummy!!! Going to have to make these, my mouth is watering. 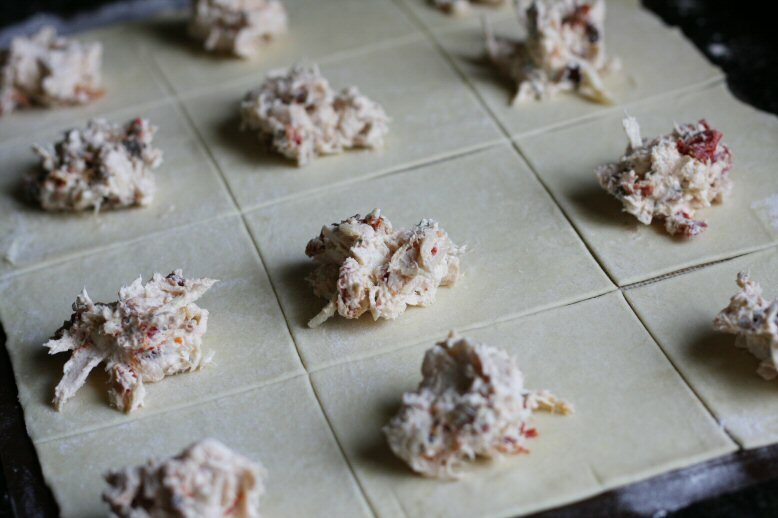 MMmmm…you could also make chicken pot pie pockets using defrosted peas and carrots instead of the bacon and sundried tomatoes. If they were made a little larger, you could serve them for lunch or dinner with a nice salad as well. I will have to try this. I'm going to be making puff pastry soon and this would be a great use for it! how many do u think this makes??? Thanks! My whole family loves this recipe. What would you suggest as sides for this? 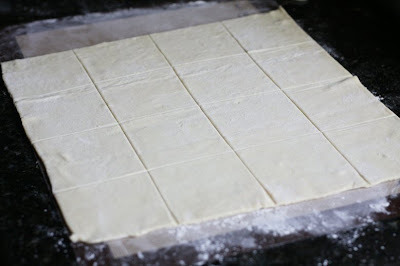 kristenn– I got 32 (two sheets of puff pastry, each cut into 16 squares). We made half for dinner and froze the rest for a Super Bowl party tomorrow. We loved them! C- I like to just serve them with a great salad. Easy! Made these tonight!! SO SO yummy! My family loved them, as did I!! I made these for dinner tonight. They were dreamy!! Very rich tasting. The cheeses inside were so creamy too! Thank you for sharing! My husband is not a big fan of sun-dried tomatoes so I just used a can of mushrooms and chopped them up. It was deeeelish! Love the onion and chive cream cheese!! These look SOOO good!!! I’m going to have to grab the puff pastries next time I’m at the store. 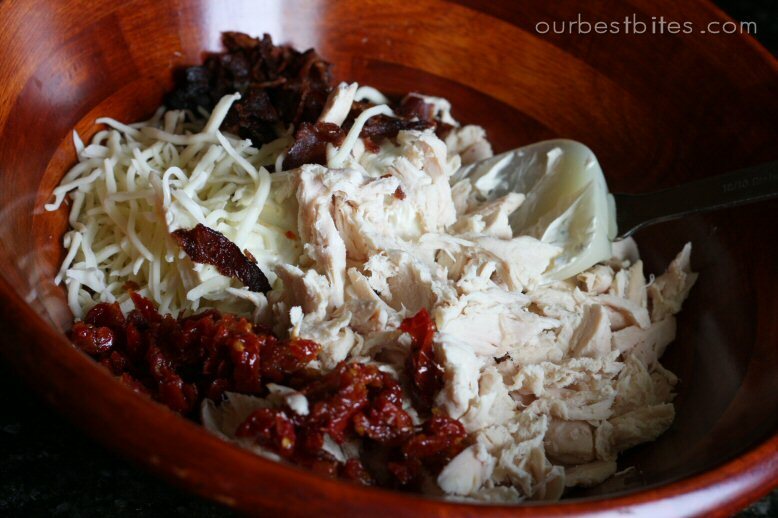 When we do recipes with shredded chicken, we learned a trick from a friend of ours – we cook the chicken, then put it in the stand mixer – and turn it on low – and presto – shredded chicken with out all the obnoxious effort! I’m wanting to try making these for a baby shower. How many does each recipe serve? I would imagine that, since each box of puff pastries come with 2 sheets and each sheet can be divided into 16 squares, you can get 32 pastries out of it. But I just wanted to check. I didn’t know if the filling recipe made enough to fill all 32. Thanks! Sounds super yummy! They will LITERALLY call your name?! That sounds terrifying! Just made this. I had to sub out the tomatoes (didn’t have any on hand) but they were great! I even snuck some peas in there….yummmy! Making these for Superbowl today!! Also changing it around to make a batch of sausage & pepperoni ones! Thanks so much for this recipe!! Have made it several times and everyone LOVES them!! I made these for Superbowl, they were so good, I could not stop eating them. Thanks! Just made these on the spur of the moment, and replaced the sun dried tomatoes with three desert spoons of red pesto – they were great ! I’ll be making these for my niece’s baby shower brunch. Love the make ahead/freezer instructions. Thank you! 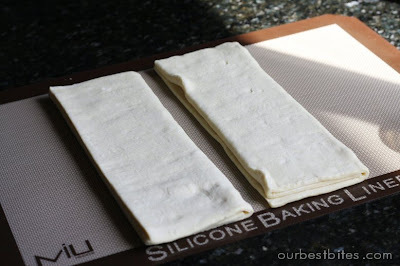 These take a little work (especially when I always forget to thaw the sheets! ), but are definitely worth it. We’ve made them a few times now. Thanks for sharing another incredible recipes, Sara! So, dumb question- is ‘puff pastry’ the same thing as pie crust? These look so fabulous! But I can’t seem to find puff pastry anywhere! Nope, it’s different! 🙂 You can find puff pastry in the freezer section. You can make them and freeze before baking. Bake as usual, only it will probably need a minute or two longer.